Posted on February 27, 2015 by Katrina C.
Earth is made up of nearly 71% water, so it is no wonder that scientists have spent a considerable amount of time analyzing this important resource. The analysis of our water system often requires the use of color density measurement to determine exactly what particles make up water supplies. From the massive percentage of water in our oceans, to the more limited fresh water resources we have, color density measurements can be used to effectively analyze the safety and sustainability of the most abundant part of our ecosystem. Water is one of the most important resources we have here on Earth. Scientists rely on effective research and analysis to provide important data needed for sustainability of our waterways. The secret to maintaining healthy waterways depends on more than just clean water. Natural water systems are made up of millions of micro-particles that create either stable or unstable conditions. Maintaining healthy conditions depends largely on algae content levels. Algae can tell us a lot about water quality and is often used to alert environmental chemist to potential hazards that may threaten our water systems. In waste water, analysis of algae is often used to indicate the chemical compounds that are present and measure toxicity levels. The color density of the water sample indicates the amounts of algae present, which are directly influenced by the other chemical compounds present in the sample. Measuring algae in water samples requires the use of color density measurement and analysis to determine chlorophyll content levels. These measurements originally required the use of microscopic technology and the tedious process of counting out the tiny biomolecule particles in order to quantify the saturation of chlorophyll in water samples. 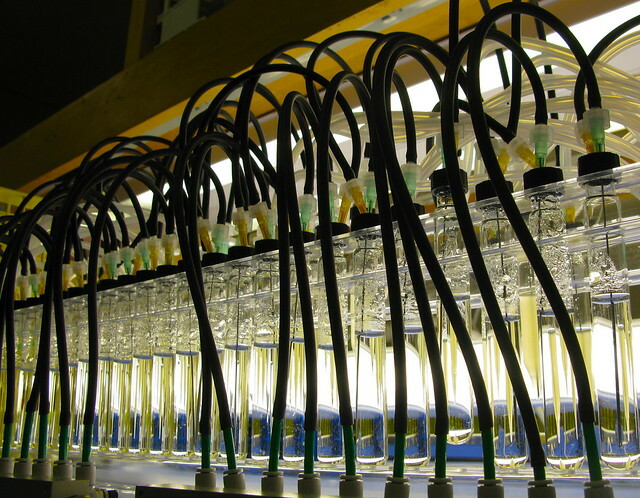 There are numerous methods for analyzing algae content in water samples, but spectrophotometric determination of chlorophyll through light absorption reading and color density measures provided the most effect method of analysis. Spectrophotometers, however, offer the ability to determine the chlorophyll content in water samples through the use of light absorption values and color density analysis. The amount of light that is absorbed by a water sample can provide quantifiable data about the chlorophyll content levels both quickly and accurately. This method is far more efficient and superior to the manual quantification process, which can be both time-consuming and often unreliable. Spectrophotometric instrumentation provides a portable and durable alternative to the aforementioned analytical process and is highly effective for real-time field of study data. This tool provides a way for scientists to instantly determine irregularities or changes in algae content that may alert environmentalist to the possible presence of water contamination or hazardous materials. Continual monitoring of water quality through chlorophyll analysis is important towards maintaining healthy waterways and protecting marine life. Spectrophotometric analysis is a science in itself. When selecting color measurement tools, it is important to choose a company that specializes in many areas of color measurement. At HunterLab, our instrumentation is uniquely designed to cover a multitude of applications. We specialize in chemical analysis and work together with our clients to find the right tools to meet their specific needs. If you are looking to learn more about color density measurement and analysis, contact HunterLab today and let our friendly staff introduce you to the science of color measurement. ← What Color Quality Says About Food: How Does Your Product Measure Up?